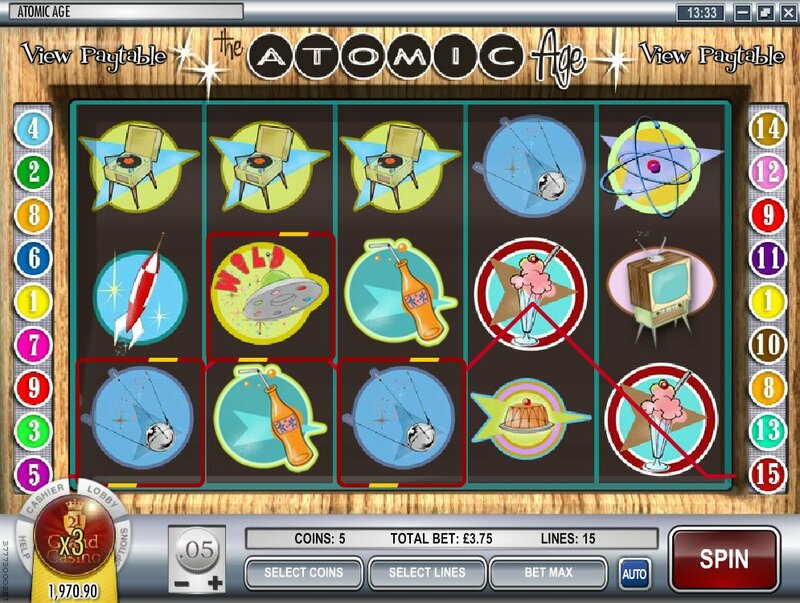 The Atomic Age slot brings the 50’s and spaceships together. Rockets launch and, you are left with the task of winning yourself gold coins amongst the clashing cultures. The one bonus round I managed to play was great fun, taking me back to a simpler time, not to mention cheaper! All in all, there is a great amount of coins to be won if you spin these reels. In another era, at another time, a man and a woman sip margaritas out of those funny glasses that make it all too easy to spill what you are drinking all over your face. As they sit on the couch, we get the feel that we have been transported back to the 60's. The spaceship that starts this sequence, is flying to earth the whole time and, as the couple innocently watch TV, a gramophone with LP's strewn around sits forlorn in the middle of the floor. A wibbly wobbly jelly, in the shape of the spacecraft we saw is produced and, then a rocket blasts its way upwards, starting the Atomic Age 5-reel, 15 payline slot. 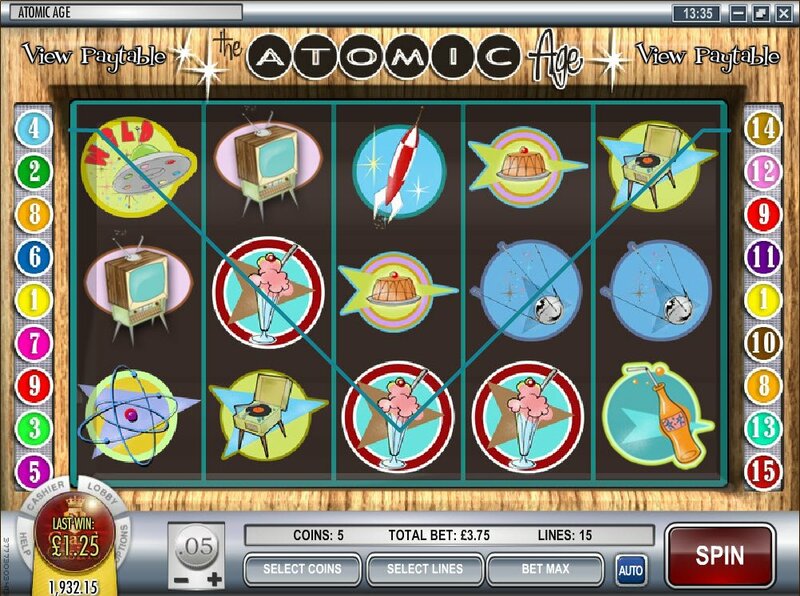 In graphics reminding us very much of the 50's; cartoonish, sharp and somewhat jagged, the Atomic Age software by Rival Gaming is not one of its finest moments but, it certainly does bring us back to a different time, to enjoy a new approach to winning coins on the reels. A wibbly wobbly jelly, in the shape of the spacecraft we saw is produced and, then a rocket blasts its way upwards, starting the Atomic Age 5-reel, 15 payline slot. The music is the chattering of a casino, with the dull sound of glasses clinking in the background and people chattering, very much a timeless effect. The jazzy, repetitive beat of the strumming bass guitar is soothing but, after a short amount of time will make you think you are stuck listening to a scratchy old LP that has decided to stay in one of its grooves. In a mish mash of icons from the 60's and futuristic space symbols, the wild spaceship with all the different coloured lights will net you an amazing 7500 coins. 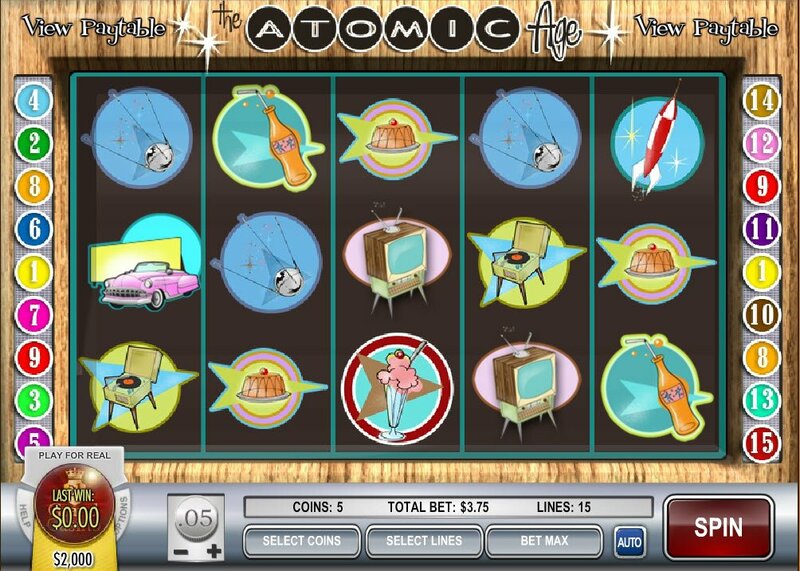 The cash register is your ticket to a cash register Atomic Age Slot bonus round, where you will be given an amount of money and a range of store products. Pick the items that will match the amount you were given and, see how cheap shopping was back in the day! The pink Cadillac drive in bonus round is one I did not manage to enter and, I would love anyone that has had the joy of playing this to comment below and tell me what it's all about!